The Cellometer image cytometers are capable of performing automated concentration and viability measurement using both trypan blue and fluorescent methods. The fluorescent instruments such as Auto 2000 and K2 determine viability by counting cells stained with acridine orange (AO) and propidium iodide (PI). This allows for accurate detection of nucleated cell in samples such as PBMCs and splenocytes that contain red blood cell contamination. The Auto 2000 has been validated for accuracy, reproducibility and linearity against manual counting using a hemocytometer following the recommended testing guidelines set by NIST (National Institute of Standards and Technology). Following the guidelines published by NIST, linearity of the Auto 2000 was performed by measuring different Jurkat cell concentrations, plotted on a graph with expected cell concentrations compared with the measured cell concentrations. 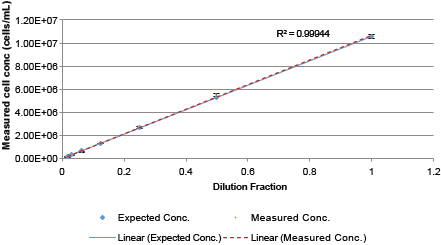 R2 value for the measure cell concentrations was >0.999 and the error bars overlaid with the expected cell concentration line.